Outlined in red, the original Cedars was a few blocks north of Georgetown University. Detail: The national capital, Washington, D.C. Sketched from nature by Adolph Sachse, 1883–1884. Library of Congress Geography and Map Division. 75693178. That’s the common but mistaken reaction to DC and federal requirements that call for an archaeological assessment before the alteration or demolition of a federally designated historic property. And it’s one that Stantec archeologists Paul Kreisa and Nancy Powell handily dispelled while discussing their recent work at the Duke Ellington School of the Arts during a recent lunchtime seminar at The George Washington University Museum and The Textile Museum. 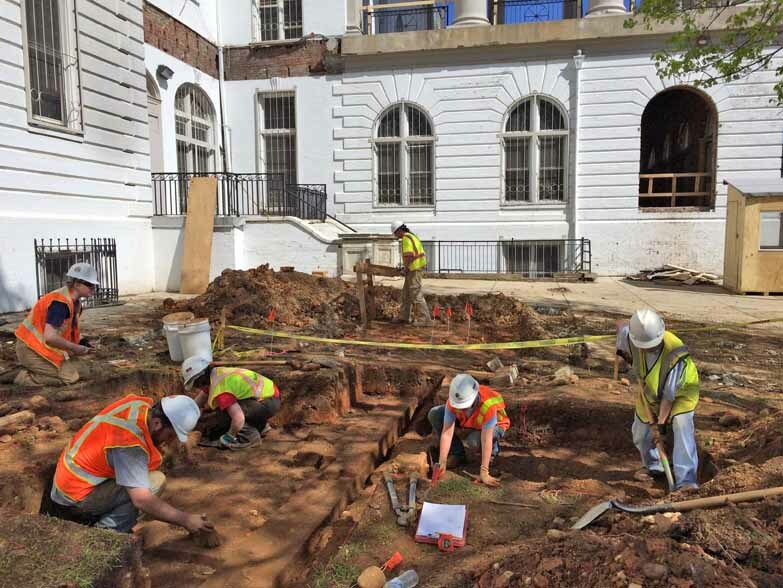 Archeologists conduct investigations on the southeast façade of Duke Ellington (along Reservoir Road). photographs and Plan courtesy of Stantec. Before Ellington. But even before the first shovel hit the soil, quite a bit was already known about the site and its earlier inhabitants. The site was part of the 1,000-acre Cox Farm in Georgetown, which was originally owned by Henry Cox, father of John Cox, Georgetown’s longest serving mayor (1823–1845). The family residence, Cedars, was built in the 1820s but destroyed by fire in 1847. A second Cedars, likely constructed near the first, was rebuilt shortly before 1850. After that, the structure had several owners and renters, including the federal government, which confiscated it in 1863 as the National Home for Destitute Colored Women and Children. The building was later used as a girls school until the DC Commissioners bought it in 1896, tore it down, and began construction in 1897 on Western High School (which later became Duke Ellington). 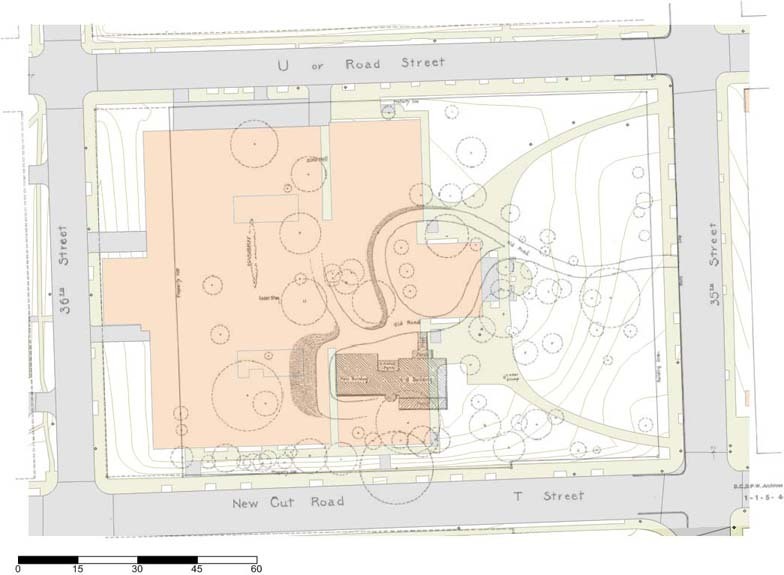 As part of its investigation, Stantec dug many excavation units which uncovered part of the foundation (above) of the eastern façade of the second Cedars and a patio area. What they found. Cut-and-fill analysis revealed that the wooded site was originally sloped and that soil was moved from the western side to fill in a ravine in the east, leveling the ground for construction of Western. The team also recovered some 1,500 artifacts, many predating the second Cedars—including shell and metal buttons, glass and bottle items, porcelain and other ceramics, and clay pipe stems. A Minié ball dates to the Civil War. These artifacts reflect access to an array of goods and the transition of this part of DC from a rural enclave to a vibrant urban setting. And what will become of the artifacts found there? For now, they will be maintained by the Office of Planning. DC archaeologist Trocolli expects that, after the renovated school reopens, some of them will make their way into an exhibit at Ellington as part of her office’s public education mission. On this 1894 survey plan of the Cedars, “New Cut Road/T Street” is Reservoir Road today; “U or Road Street” is R Street.